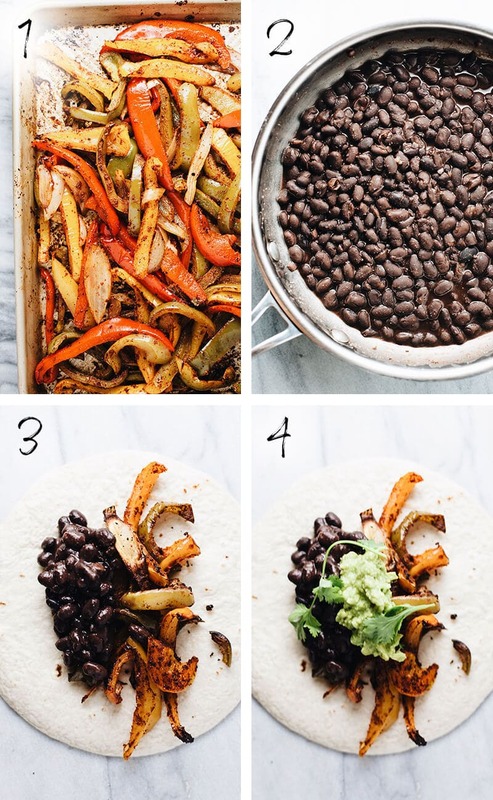 Quick & delicious Black Bean Vegetarian Fajitas – made with roasted peppers & onions, black beans, and guacamole. 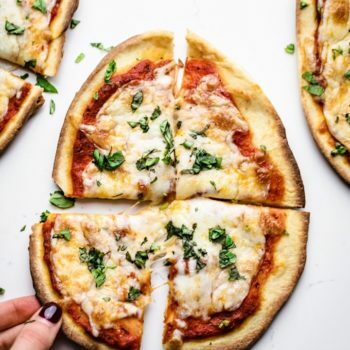 A flavorful, satisfying meal that’s packed with plant-based protein, and ready in 30 minutes. 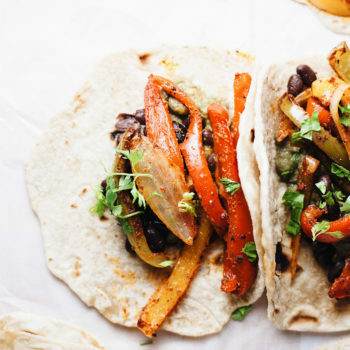 These vegetarian fajitas are also healthy and vegan friendly! 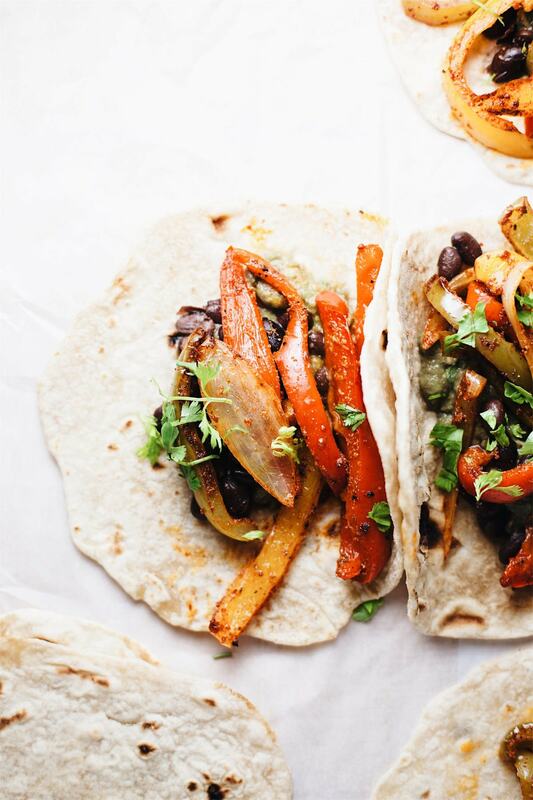 Say hello to the BEST vegetarian fajitas you’ll ever try! And I know that’s a bold statement – but these really are SO stinkin’ good. All you need are a handful of simple ingredients, 15 minutes to cook, and you have yourself a quick & delicious meal. If you are used to meat-focussed fajitas, fear not. There is no missing meat in this recipe! The black beans are loaded with protein and make this dish completely satisfying & filling. Black beans – I love using black beans in this recipe because of their flavor and added plant-based protein that makes this recipe filling and satisfying. I season the black beans with a little salt & garlic powder for extra flavor. Guacamole – Guacamole not only adds delicious flavor to this recipe, but helps cool the spice from the peppers & onions, and also is another filling ingredient. You can’t go without the guac. Peppers & Onions – These are a staple for any fajita recipe – for these peppers & onions I use a homemade seasoning recipe and roast them for 15 minutes. 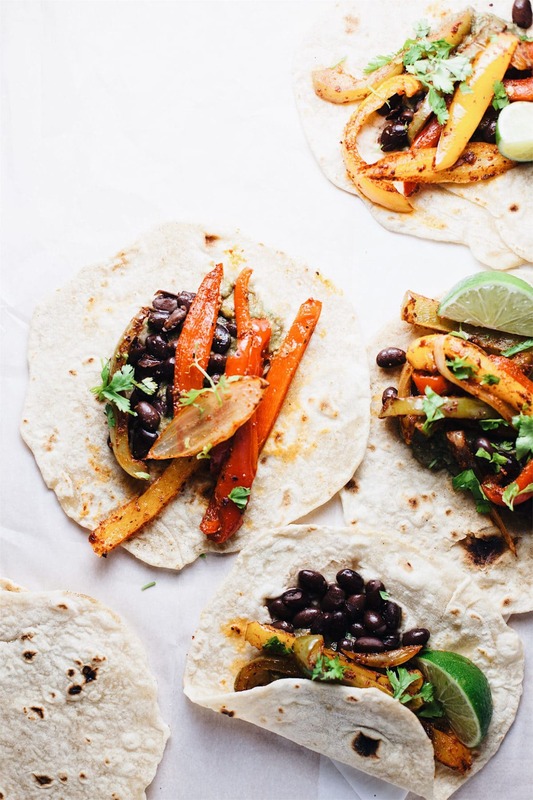 What Veggies Do You Put in Fajitas? Skies the limit for the vegetables you can season and roast for this recipe instead of peppers in onions or additionally. Mix all of fajita seasoning together. Toss peppers and onions in olive oil and fajita season. Bake in oven for 15 minutes. Heat black beans on stove top for 3 minutes until warm with salt & garlic powder. 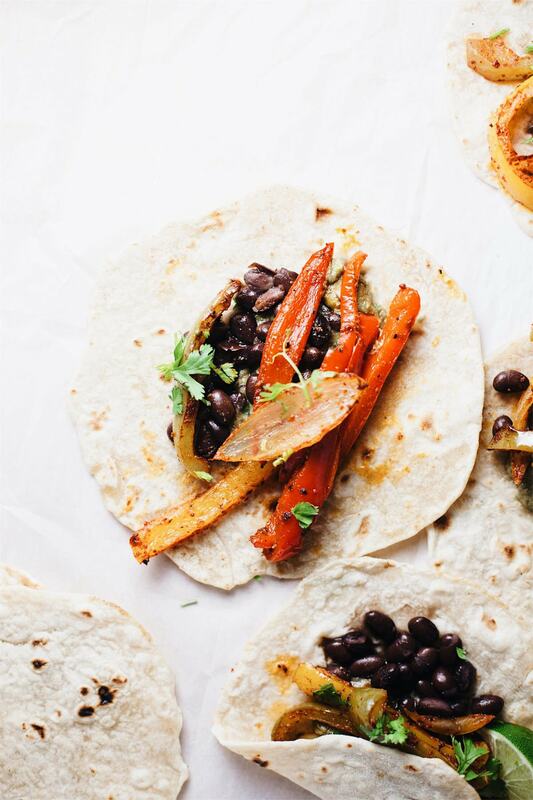 When peppers are cook assemble fajitas – tortilla, black beans, peppers & onions. Add toppings to fajitas – guacamole, cilantro, splash of lime. No black beans? You can use garbanzo beans, pinto beans, or white beans for this recipe in place of black beans. Serve rice or quinoa as a side dish for these fajitas. Choose good quality tortillas or make your own. Make this recipe gluten free by serving with GF tortillas or serve fajita ingredients over rice/quinoa. Quick & delicious Black Bean Vegetarian Fajitas - made with all wholesome ingredients, is satisfying, flavorful, and a healthy 30 minute meal! Preheat oven to 400F. Mix all of fajita seasoning in small bowl. Toss sliced peppers & onions in 2-3 tbsp olive oil and all of fajita seasoning until well coated. Lay evenly on a sheet pan. Bake for 15 minutes until vegetables are nicely roasted - flip veggies at 8 minutes to evenly roast. Heat black beans in small pot on low heat for 2-3 minutes with a pinch of salt. Warm tortillas in oven for 1-2 minutes or microwave for 30 seconds. Remove peppers & onions from oven. Assemble fajitas: Tortilla, black beans, peppers & onions, guacamole, splash of lime juice, cilantro. Serve with rice/quinoa - enjoy! These fajitas are super good! Especially the spice on the veggies. Yum! Easy, nutritious dinner. Spice mix was perfect for us with the suggested pinch of cayenne. Made this for my husband and he loved it! I was so surprised at how satisfying they were without meat. Definitely making again!! 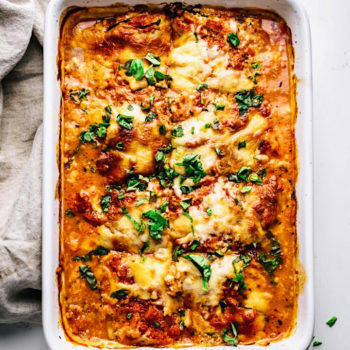 This recipe is definitely one of our favorites. 😊 Thank you for trying! So glad you liked it. YUM!!! So delicious! Especially loved the seasoning… why would I ever by the grocery store packet when I have this fresh recipe! We love fajitas! 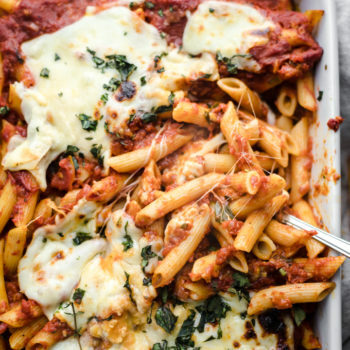 This will be perfect for Meatless Monday. Wow, these are beautiful! And the are so hearty and delicious sounding. Not to mention healthy. Win-win! Thanks Valentina! 🙂 They are definitely a win-win situation! Yum! Those veggies are caramelized perfectly! Wow, these look so good! I love the vibrant colors, and the flavoring looks so tasty.